This Clean Eating Banana Split Mousse is probably the most amazing thing I’ve created in a long time! Let me explain this unique little treat so you can fully appreciate it. Normally, banana splits come with bananas, ice cream, whipped cream, fudgy syrup and nuts. But here’s what I did to transform the unhealthy traditional version to a clean eating dessert. First, I substituted the ice cream and banana with a fluffy banana mousse. It’s very similar to my Clean Eating Vegan Lemon Mousse recipe, except I added a banana instead of lemon. And when you take a bite of it, it tastes like you are eating a bite of banana ~and~ whipped cream from a traditional banana split! Then I drizzled the top with some homemade cacao drizzle, sprinkled some chopped walnuts and topped it with an organic cherry. In all fairness, the ingredient list is for three different flavors of ice cream, but would it be any healthier with only one ice cream flavor? Answer: No. It’s a dairy and GMO nightmare with food coloring, stabilizers, artificial flavors and since it’s not organic, contains pesticides. This healthier, clean, real food dessert is “almost” raw, vegan, gluten-free, dairy-free, egg-free, paleo-friendly and contains no refined sugar. Want more healthy dessert recipes? Check out Vegan No-Bake Peanut Butter Cheesecake, Fudgy Peanut Butter Crispy Squares, Vegan Flourless Zucchini Brownies, or my Clean Eating eCookbook with an entire chapter of 20 healthy, clean eating desserts just like this one that you will love! Tip #1: I found the banana mousse to be sweet enough using just a banana, but if you feel it needs a little extra sweetness, just add 1 – 2 tablespoons of your favorite organic granular sweetener. Step 1 Advanced Preparation: Add a can of full-fat coconut milk to the back of the refrigerator ~at least~ 24 hours before making this recipe. Add the hardened coconut fat and banana to a mixer and mix on high speed until it turns into a fluffy mousse, but taking care not to over mix (you'll want to leave small pieces of banana in the mousse). Prepare the cacao drizzle by adding the raw cacao powder, maple syrup and melted/liquid coconut oil to a small bowl and stir until it's well combined and smooth. 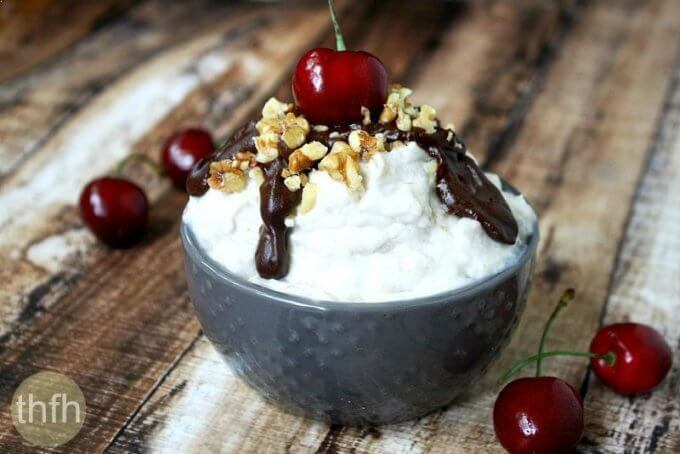 Transfer the banana mousse to a small bowl(s), drizzle the cacao mixture over the top, sprinkle with chopped walnuts and top with a cherry. This recipe will make approximately (1) large or (2) small servings. 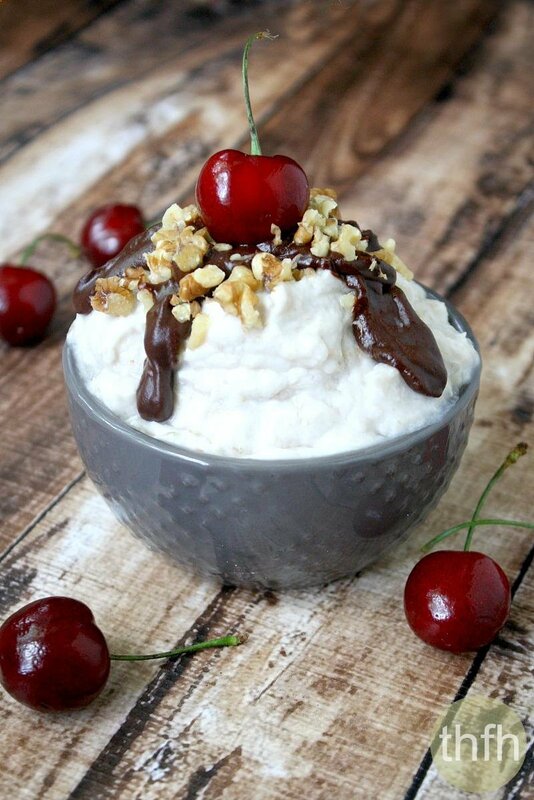 The recipe and photographs for "Clean Eating Banana Split Mousse" by The Healthy Family and Home are licensed under a Creative Commons Attribution-NonCommercial 4.0 International License and cannot be used without my written permission. OMG this recipe looks amazing! I love bananas and coconut milk.